Travel to the revitalized Casco Viejo for old-school Havana vibes minus the cars and tourists. Casco Viejo is Spanish for “Old Quarter” and is a place you cannot miss. Also known as Casco Antiguo, the walled city of restored Spanish Colonial architecture is the most visited place in Panama City, second only to the Panama Canal. In 1997 UNESCO named it a World Heritage Site initiating the neighborhood’s renaissance. This burgeoning cultural center of Panama City has some of the best nightlife, hotels and of course places to eat! After mapping out the options with a local tour guide who lives in Casco Viejo and trying dozens of places, here are the best and most photogenic places to eat in Casco Viejo. 1. Nomada Eatery: This “Nomad” eatery is located just at the entrance of Casco Viejo and offers the best atmosphere for brunch with backdrop options of palms, local art or a neon sign that says “Stay Wild Enjoy the Ride.” Inside there is even a sign that invites local artists and nomads to share their art on the wall. The vibes, the vegetarian friendly options and inviting staff make this a top choice for breakfast, lunch and dinner! 2. 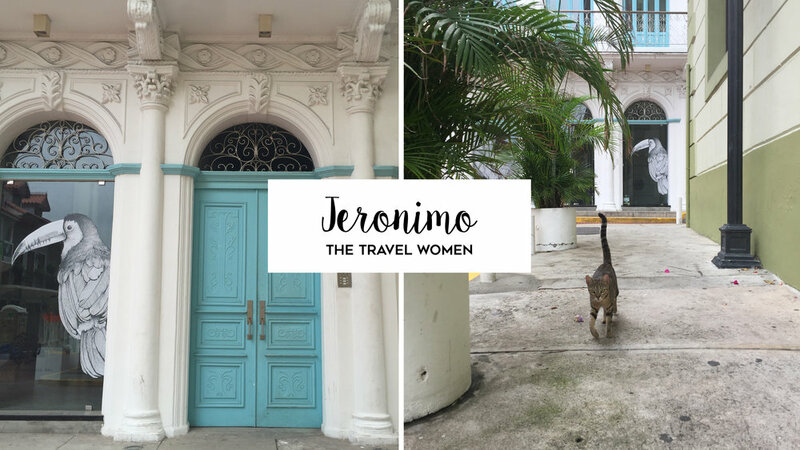 Jeronimo: The restored white building with charming tiffany blue doors and details stands tall on the highest part of the castle wall of the old city. There is a speakeasy behind the gallery where trendy cocktails are poured while conversations over art are had. To get into the speakeasy you need a password. Check their Facebook page or Instagram for the current password. 3. American Trade Hotel: This is the largest Hotel in Casco Viejo located in the neighborhood’s center. The ACE boutique hotel renovation takes up a full city block. Walk into the lobby and admire the beautiful floor tiles and tropical details over coffee or brunch. There’s even a rooftop pool and a jazz club. This spot is not to be missed! 4. Tantalo: Local upcycled items and murals of graffiti decorate this hotel, kitchen and rooftop bar. Order the pulled pork on round chunks of corn tortillas. 5. Casa Sucre Coffeehouse: Coffee from Panama’s Boquete region is the must-have at this eclectic spot. Historic decorations include a record player and a piano with a sign inviting musicians to play it. 6. Palettamerica: For the best fresh fruit and ice cream flavors on a stick, try Palettamerica. Some options include chunks of fruit or Oreo or Kit-Kit in the pop. Some even have a coconut milk filling! Then you can have it dipped in white, milk or dark chocolate and add your favorite toppings. 7. Sweetea Day: One of the few boba or bubble tea places in Panama city, Sweetea Day has the best fresh smoothies and flavor options. They are reasonably priced and refreshing on a hot day. 8. 9 Reinas: This bright Argentine restaurant is set in the Central Hotel. 9 Reinas means 9 queens and is named after an Argentine crime film. It’s perfect for anything from a coffee to dinner. 9. Mahalo: This Canadian run hidden gem is all about health and wellness. Events regularly introduce games, live music, Yoga and Pilates into the space. This relaxed garden space also welcomes dogs. Try an amazing power bowl for fresh fruit displayed beautifully. 10. Oro Moreno: Oro Moreno offers the most amazing local chocolate cultivated from sustainable cocoa grown in the Bocas del Toro region of Panama. Try their handmade chocolates in flavors like passion fruit, pineapple or coffee. The atmosphere is ultra-chic with red velvet chairs, painted palm walls and gold tassel lights. 11. Finca del Mar: This outdoor bar opens on both streets and has fun decorations including part of a painted school bus. Grab a cold drink and sit at one of the hammock chairs at the bar for a relaxing afternoon. Where’s your favorite spot to eat in Casco Viejo? Comment below! I enjoyed reading this article. The food and desserts look delicious and now I’m hungry! The photos of the hotels were beautiful. After reading the blog, I would like to visit Panama and have added it to my bucket list. I had no idea how beautiful and interesting Panama was. You certainly sold me!! Thank you so much. Also, you are a great writer and photographer. Thanks for the overview. Your list will save me a lot of time looking for great places to go. Well done.